Reviews Savage Sword Of Conan#1: Totally Savage! Savage Sword Of Conan#1: Totally Savage! In a world where one series per character isn’t enough, Marvel presents multiple Spider-Man titles . . . and the Savage Sword of Conan! Now you can have double the gore, double the abs and double the Crom! Before you know it you’ll be sporting a loin cloth and punching camels. From the Publisher: Adrift at sea. No food. No weapons. Death surely awaits him. But the lionhearted CONAN is not so easily subdued, by Crom! When Conan finds himself captured, he unleashes his might on an unsuspecting pirate crew…one whose dark secrets will plunge Conan on the trail of an ancient treasure that may prove to be his undoing! All joking aside, I think it’s impossible to have too much Conan the Barbarian. Which is a good opinion to have, because Marvel plans to build a new Conan universe so this series is far from the last. Luckily for us, Savage Sword it’s another well written, nicely illustrated, and blood spattered tale sure to please fans of this surly Crom worshiper. Gerry Duggan (Deadpool) seems to know what he’s doing as he guides the blood thirsty Conan down a body covered path in search of fortune and death. The story flows smoothly along giving us plenty of action as it goes. The biggest disappointment for me was that he doesn’t fight skeleton pirates as depicted on the cover. I was kind of hoping for a Conan Vs. The Pirates of the Caribbean type thing, but alas that series hasn’t come yet though knowing Marvel I wouldn’t count it out. Good old fashioned Barbarian violence isn’t worth spit, if it isn’t depicted properly. So it’s a Crom darn good thing they have an artist like Ron Garney (Thor God Of Thunder) working on this book. His style harkens back to the sword and sorcery comic books of yore. Every nose breaking, eye gouging moment is delivered with the utmost detail and it’s hard not to become immersed in the bloody action. If you have any interest whatsoever in Conan or enjoy the epicness that is the sword and sorcery genre, then you should absolutely check out this book. It’s action packed entertainment at it’s finest, made even better by the fact that it follows the unstoppable barbarian we all love (and I’m not talking about Dave). Just sit back, relax, and pity those that get in the way of the Savage Sword Of Conan. P.S. 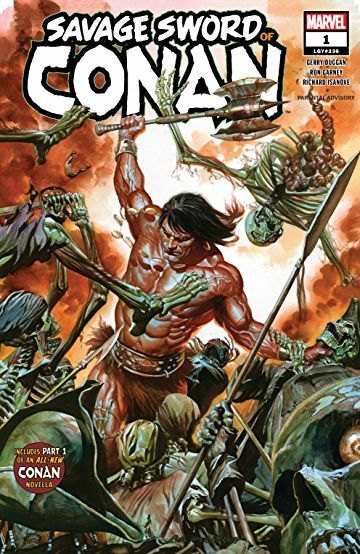 If you want even more Conan check out Age Of Conan: Belit which will be hitting the shelf March 13th.